In 1700, Padres at some California Missions grew cotton on a limited basis for their personal use. It would take nearly two centuries before cotton would be grown for consumer use, and that occurred in Valley Center in 1888. 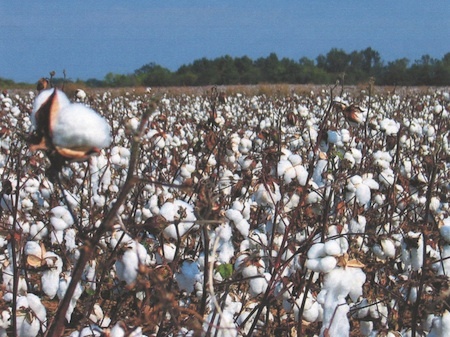 An experimental planting of 30 acres produced a harvest of five full bales of cotton. It was considered a successful venture. Growers in the Central Valley of California took notice, but it would not be until 1919 – the end of World War I – that the first commercial planting of cotton would occur in the San Joaquin Valley, paving the way for California to become a major cotton-producing state. The initial cotton field in Valley Center was planted by James Brundsen and John W. Moore who leased 30 acres from owner San Antes at the present-day intersection of Valley Center and Cole Grade roads (a parcel at the rear of the Post Office and Bank). To note the historic site, a souvenir bale of cotton was presented to the Valley Center History Museum in 2003 by grower-members of Calcot Ltd., a cotton trade organization.